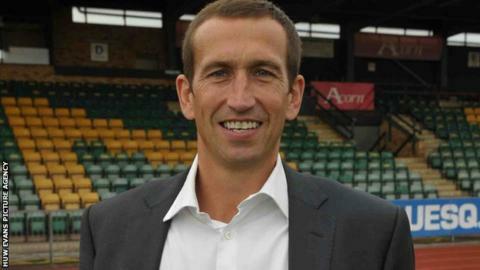 Newport County manager Justin Edinburgh has urged his players to beat Darlington on Tuesday to secure their Blue Square Bet Premier status. Newport's superior goal difference could mean a point will stave off relegation, with three games to play. But a win would give Edinburgh the chance to plan for next season. "It will give us a good opportunity to get ourselves organised and talk to the players we want to remain at the football club," said Edinburgh. "We can go about our business quite early to bring players into the club for next season. "So sooner rather than later as far as I'm concerned." Three of the four relegation places in the Conference have been decided. Hayes And Yeading look set to join Darlington, Kettering and Bath City in going down, realistically needing two wins from their remaining games and hoping for other results to go their way. But a win for County would take them clear of the relegation dogfight, and Hayes' relegation would be confirmed if Telford United also won on Tuesday. Former Tottenham Hotspur defender Edinburgh was appointed Newport boss last October. The 42-year-old replaced Anthony Hudson at the helm, becoming Newport's sixth manager in nine years, and was tasked with keeping The Dragons in the Blue Square Bet Premier. "There's a great togetherness in this group," added Edinburgh. "It's edging us ever closer to safety in this league, which was my remit when I first came to the football club." Newport can look forward to a Wembley showdown with league rivals York City in the FA Trophy Final on 12 May. The sides have met twice in April, with Newport beating play-off hopefuls York at Spytty Park at the start of April. A Nat Jarvis goal then secured a point in a 1-1 draw at Bootham Crescent two weeks later. "We've learnt a lot about each other over the last two games," said Edinburgh. "But we won't become complacent. We know how dangerous they can be." Newport hope to welcome back captain Gary Warren for the visit of Darlington. Warren has missed the last two games, against Kidderminster and York, with an ankle injury but his return would see Andrew Hughes revert to left-back, with Lee Baker dropping to the bench. Darlington defender Paul Johnson is set to return after serving a one-game suspension.